It’s been too long since I’ve written on my coffee shop blog. Since the last post, I did take a trip to Los Angeles and wandered my way along the PCH (Pacific Coast Highway), coffee shop cruising and couch surfing along the way. Although I did take photos and notes about the places between Las Vegas and Los Angeles that I stopped to sip, gulp, and savor my cups of coffee at, there was a bigger purpose to my trip, one that would change my life and lifestyle significantly – meeting people who were happy, living in the moment, and loving life. After I packed my bags to leave my friend’s home in Aliso Viejo, she suggested I drive out through San Juan Capistrano to stop near the Train Depot and mission. It turned out to be a wonderful stop. The mission was adorable and I found a historical little coffee shop, Hidden House Cafe where I enjoyed my first cuppa. On my way out of San Juan Capistrano, I noticed the Hummingbird House Cafe. The door to the cafe was open and the garden was so inviting that I wandered in and around. I walked through the cafe to the back where I found people having coffee and an older gentleman laying brick on the ground. The owner came out and told me that they were changing the back to make it easier for people in wheelchairs and women who wear high-heeled shoes. I knew I was meant to be there. The owner greeted me and offered to make an espresso. He then introduced me to one of his regulars – Julianna, a woman with the beauty of a Greek goddess. I took a couple of photos of her in the cafe, before sitting down with my espresso. We shared our stories over the delicious hummus the owner offered to us. Much of what we talked about was our mutual belief that what we need to do, especially women with women, is to love and support each other. After a couple of hours it was time for me to head back to Las Vegas. Before leaving, I got a message from work regarding a meeting that would need to happen. I knew then that I did not want to return to that job, and that I was done with the unorganized chaos, competition, and drama there. Although things could change, I had stronger sense that it was time to move on from there. I made a decision to “come down from the mountain” and search for god, beauty, and wisdom outside the resort property. Now, months later, my life has changed significantly. I’m ready to write about the coffee shops in southern California and southern Utah, as a cruiser and from my perspective after working at one in the Zion National Park area. A new lifestyle with a new perspective, that life is like a cup of coffee. 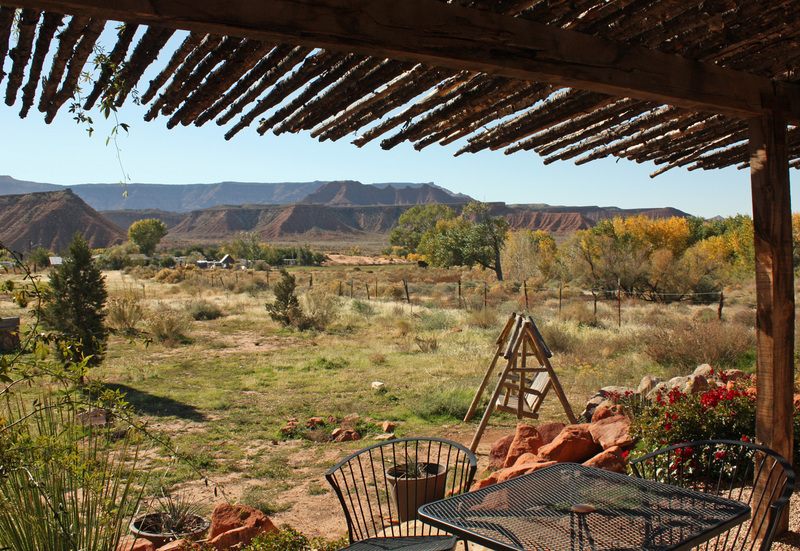 Back porch view at Red Coyote Cafe in Virgin, Utah. Jan, the owner of the Red Coyote Café in Virgin, Utah greeted me yesterday by asking how chilly it was on the other side of the park. 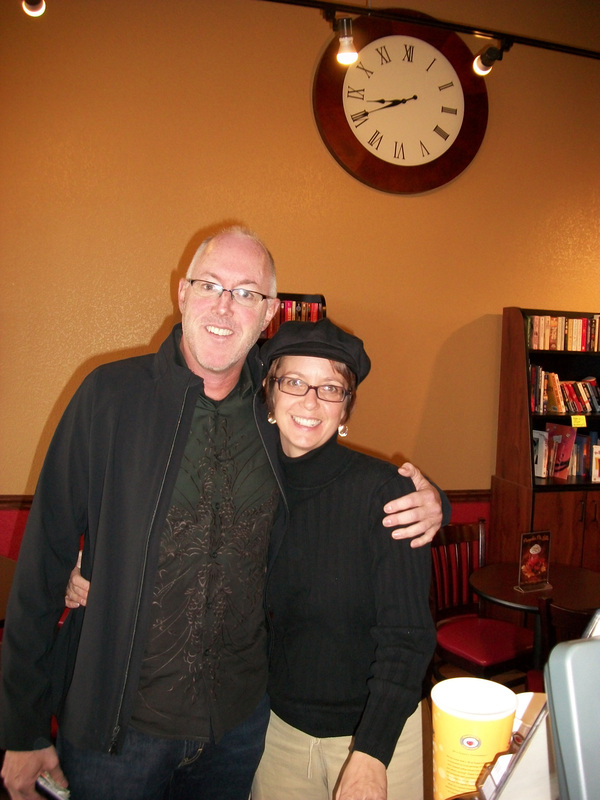 I met her just a few times and although she didn’t remember my name, she remembered where I cruised in from for a cuppa. This impressed me because often I slide into coffee shops with my laptop, sit quietly, and simply observe the world around me unnoticed by anyone. Something I like about the Red Coyote is that I can do either – slide in unnoticed or I can participate in conversations with the locals while having a cup of coffee, playing on the computer, and eating my breakfast. The best of both of my coffee shop cruising worlds. The breakfast menu includes a basic breakfast plate, burritos, and some items that are more creative, like her southwestern version of Eggs Benedict. The sauce is homemade and I’ve been told by her guests that it’s delicious. I have yet to try it because I like the basic plate of two eggs, potatoes, and toast. As someone who ran a bed & breakfast/inn and dislikes making eggs, I can appreciate the perfect over easy eggs. Neither too runny nor too hard, it’s always made perfect for dipping my buttered toast in it. By the way, I love the bread – if not artisan, it tastes like it. 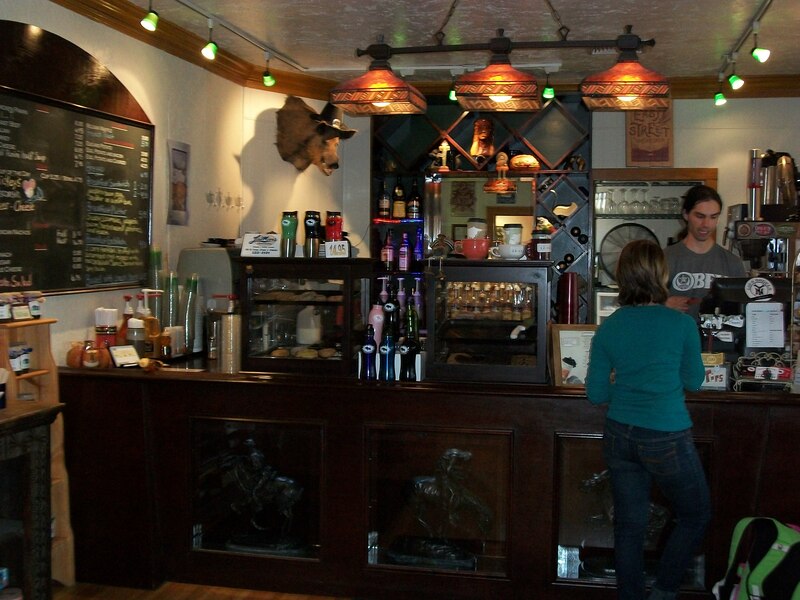 Red Coyote Cafe in Virgin, Utah. The ambiance is perfect for me – couches, tables and chairs inside, and a beautiful set up on the outdoor patio with a view of Utah’s red rocks. It has a Utah desert with a touch of country flavor to it. One of my favorite places to hide this past summer on Sunday mornings. 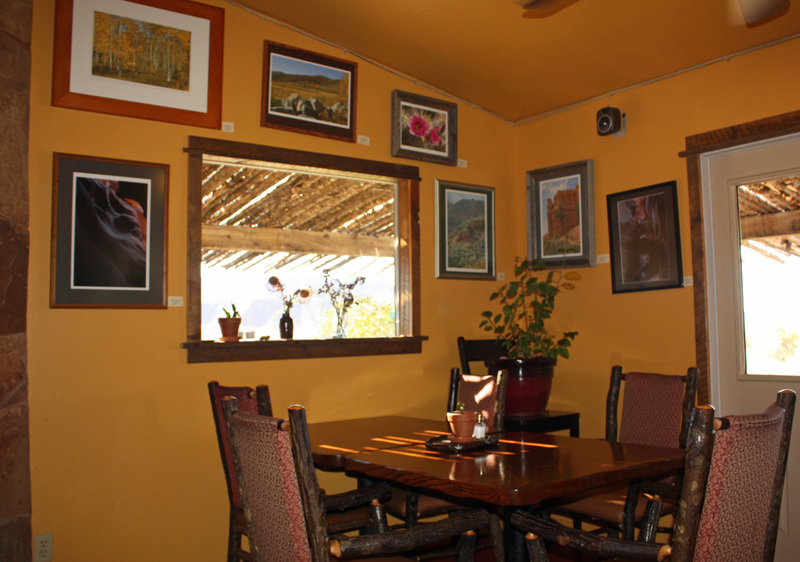 The outside of the Red Coyote displays the gorgeous artwork of Patti Lewis, a local mural artist. The mural depicts a scene id Utah desert and wildlife. Patti’s work can be seen on quite a few buildings inside and out around the Zion National Park area, as well as in Las Vegas. A sample of her portfolio and her husband, Jeff’s photography can be seen at www.lewisartservices.com. What sold me on The Red Coyote was an experience I had this past summer. After camping at Coral Pink Sand Dunes, I took the back roads towards Colorado City, then headed to Zion National Park by way of Hurricane, Utah. Once I got to The Red Coyote, I planted myself on a cozy chair, turned on my computer, and got lost in the world of Facebook and email writing. After an hour or so I realized that the café filled up with people – singles, couples, and families. The chatter in the room reflected the clientele – international visitors heading to and from Zion National Park as well as a mix of locals who came for the Sunday afternoon music. That was inside the cafe. Outside there was a spectacular lightning display as a thunderstorm rolled through. Although the storm brought many of the weary and not-so-weary travelers into the café, I’m sure the ambiance, service, and music kept them there. I was loving the experience – lost within a sea of people – something I often desire, especially when coffee shop cruising. During the winter there is music on Saturday evenings and Sunday afternoons to keep the locals and off-season travelers entertained. The summer brings many tourists through the area, so the live music schedule extends into the week. With the later sunsets in the summer, it’s one of the best places in southern Utah to end the day after hiking in Zion National Park. I can’t wait to return next year! It’s been about a year since I wrote on my coffee shop cruising blog. Yesterday I had a bug to go to my favorite in the area, take some photos, and write about it. 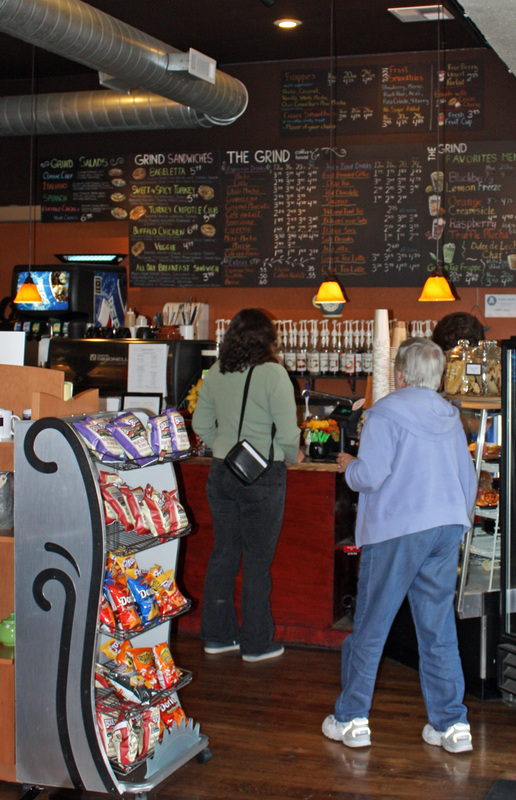 Unfortunately it was closed yesterday, which pushed me to keep driving until I landed in Cedar City, Utah at The Grind Coffeehouse. My drive there took just under three hours, which may seem a bit crazy for the normal person. I accept that I may not be normal, especially where coffee shop cruising comes in to play. I love it – being in them, people watching, spending time on Facebook, and sometimes talking to people. I’m not sure I’m a big fan of coffee, but I do enjoy holding a warm cup of coffee in my hand, smelling the aroma of it, and allowing my mind to wander to other places. It’s a social thing for me whether I’m with people or not – a way for me to be where people are, without being with people. That is what I love about The Grind. I find it to be a great place to write in my journal, sit in the morning sun in or outside, and to watch people with friends and family enjoying their drinks. Now that it’s fall the college students have returned and it seems to have a little beatnik flavor to it. This surprised me in Utah, but Cedar City is different. The community has an artsy flavor and reminds me of a very small Portland, Oregon – almost like a small neighborhood in Portland. It’s also similar to the downtown area of Fort Collins, Colorado. With the new and used bookstore next door to The Grind, it reminds me of Matter Bookstore and the Bean Cycle, where I spent a lot of time while in the Fort Collins area. Then of course, Portland and Fort Collins remind me of Madison, Wisconsin which is home for me. 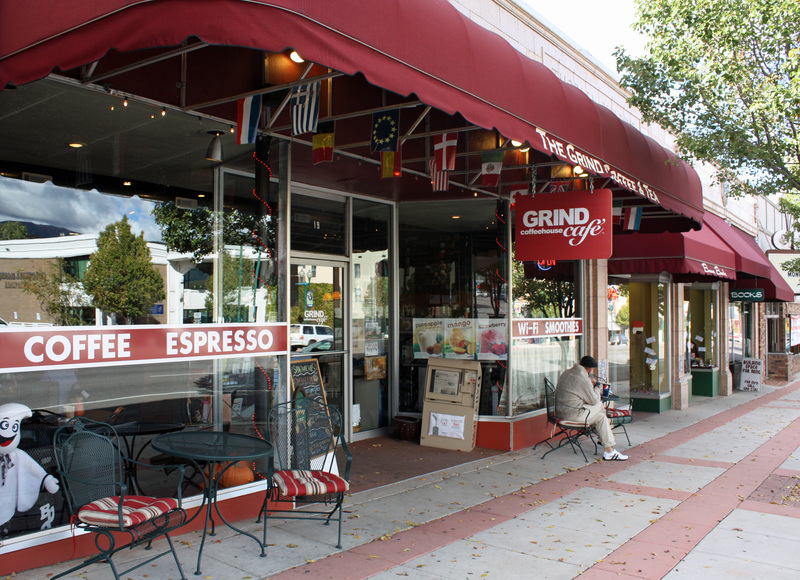 I guess that’s why I’ve driven hours to have a cuppa at The Grind – it has the ability to take me back home. 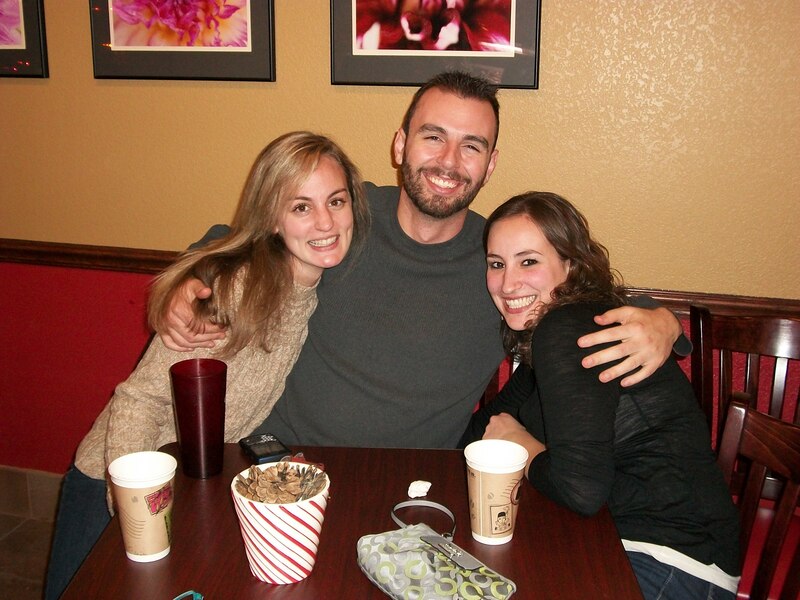 Yesterday I got a dose of home while in Cedar City. 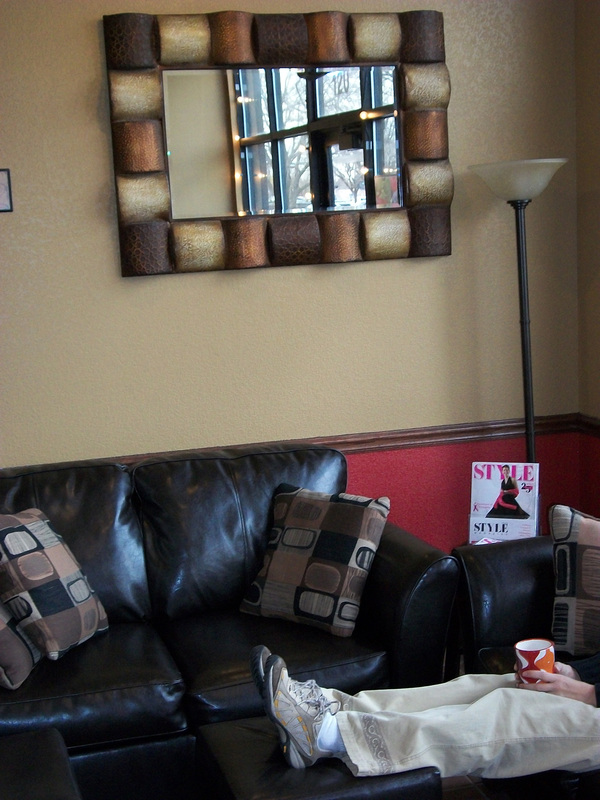 I enjoyed a spiced Chai Latte while I sat and watched people, remembering the coffee shops I’ve been to over the years. There was an elderly couple at the table next to me playing cribbage and sharing a salad. A few teenagers came in, got their smoothies and foo-foo whipped cream topped drinks and were talking about the day at school. There a few people with laptops busy on Facebook, one man on Skype, and a group of college students discussing the Make-A-Wish fundraiser they are working on for a class. Usually “the grind” stirs up thoughts of work, anxiety, and stress. Yesterday The Grind put me at ease because it provided for me what I needed to settle my anxiety before heading home for the day. It calmed my restless soul enough that when I drove through the mountains and found snow, I took the time to pull over, touch it, and take some photos. A finely grounded day. Yeah….I already wrote about Cuppy’s awhile ago, but they had such an awesome holiday open house, I had to write a little more and share some photos. 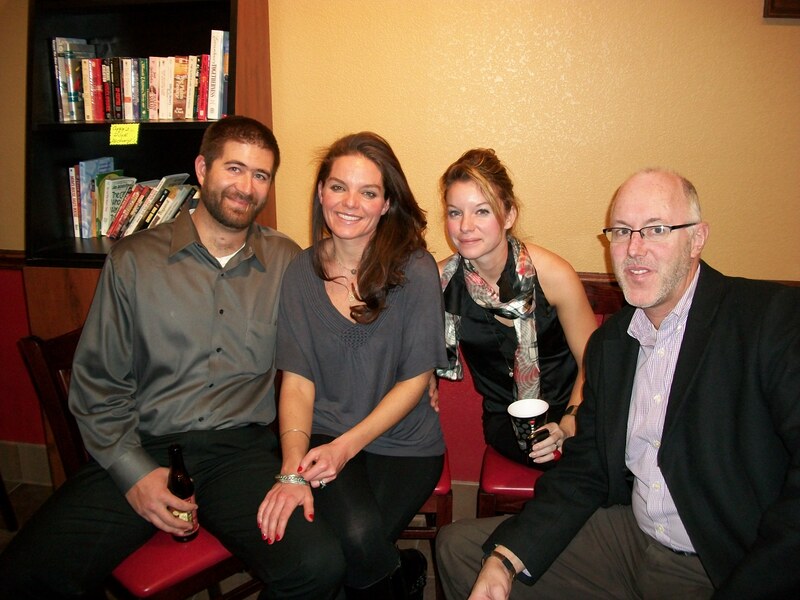 After all, it was Joe and Krista that helped me to open up and receive the love northern Colorado had to offer me. I’ve done a lot of coffee shop cruising over the years, and I think this year was the first time I was invited to a holiday party at a coffee shop. 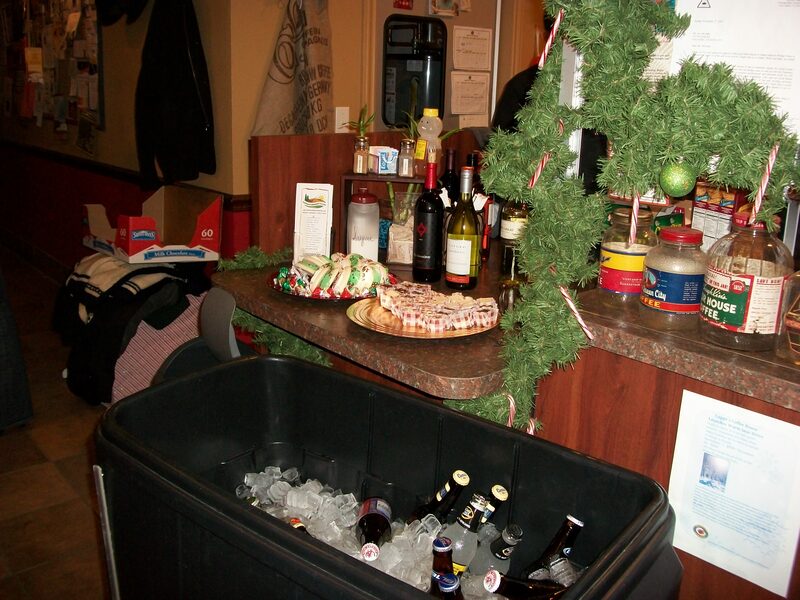 Beer, wine, and snacks for customers and friends – it sounded like so much fun. As usual, hesitating to make a commitment to anything, I sent my RSVP as a maybe. The morning of the party, after I was asked to return to my job in January (woo-hoo! ), so I knew I needed to go to the open house and reconnect with the people who were part of “Kristy finding Kristy” in northern Colorado. Not only did I spend many mornings hanging out talking to Joe and Krista before work, but I spent a lot of time laughing with them, often at myself, and often about my Facebook and other social media blunders. 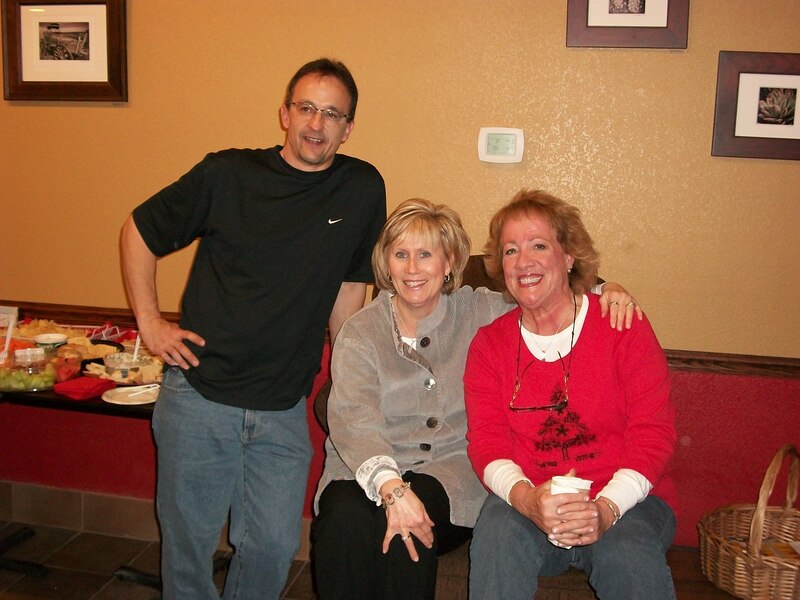 For me, it’s all about laughter at Cuppy’s, whether about me, Joe, Krista, Jim, or Krista’s postings on Facebook. Just the thought of Cuppy’s makes me smile and often laugh out loud. The party. 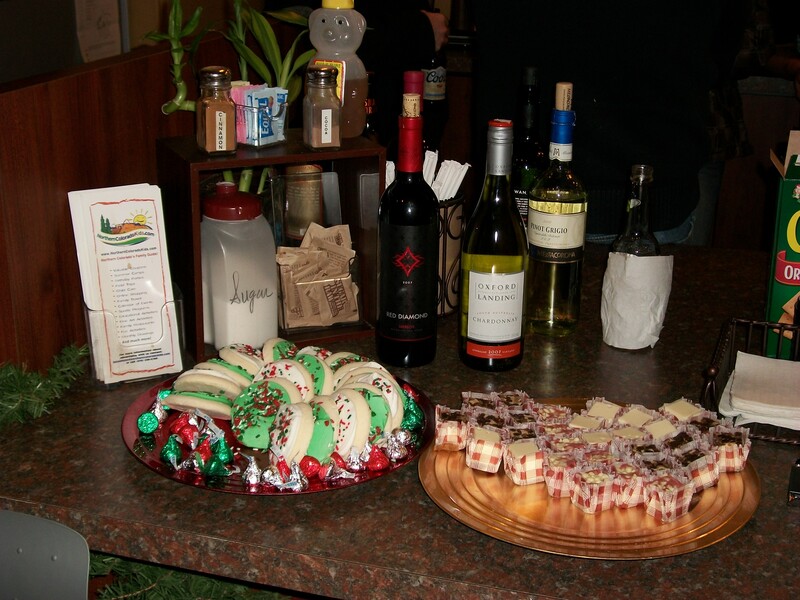 They had an impressive spread of snacks, platters, trays of food, chocolate, cookies, and cheesecake. I joined my little social group and snacked away. I spent over an hour eating, talking, and of course, laughing. Although I didn’t know everyone, there were many faces I recognized, and not one without a smile. What a great gift they’ve given all of us. 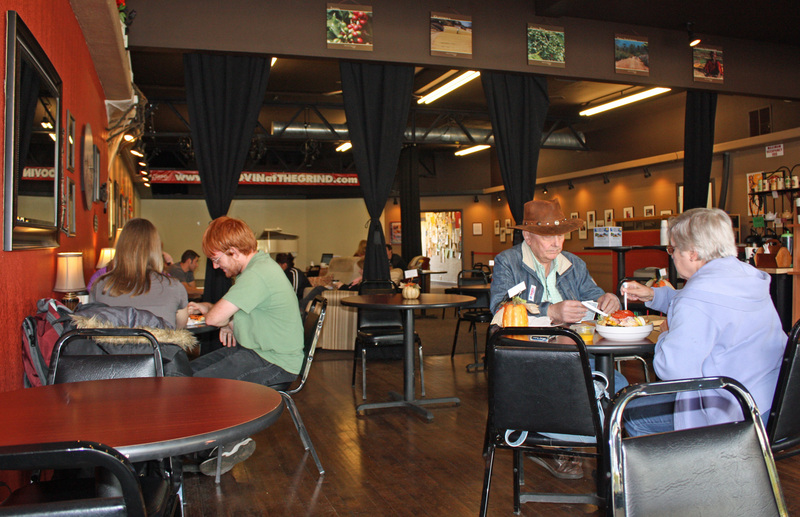 Fort Collins, Colorado has no shortage of coffee shops, each unique in its own way. The name itself makes this one a little unusual and what caught my eye. 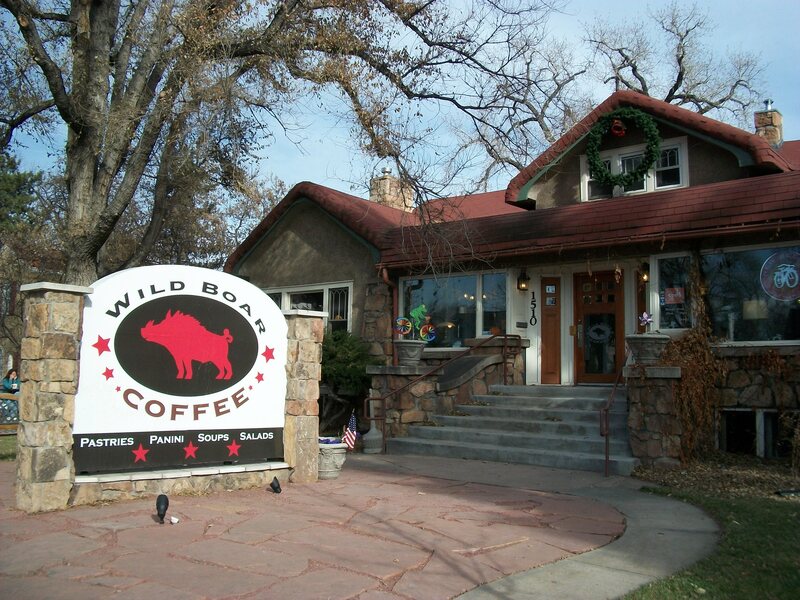 What I discovered about The Wild Boar Coffee Shop was the feeling of home. The building is a 1924 bungalow – and I have a love for the Arts and Crafts style homes. The lines, woodwork, and design flow to integrate with nature are all things I love. The porch is enclosed and makes for a fun sitting area, along with all the little rooms. Windows are in abundance, yet the lighting is just right – neither too bright nor too dark. The furniture complements the bungalow with Stickley-style tables, leather couches, and even some of the lamps. My two favorite places to sit are in the parlor on the leather chair with the ottoman and outside in one of the many patio tables. Their burritos are delicious, especially the potato and egg one smothered with green pork chili sauce. The menu includes delicious soups with artisan breads, sandwiches, and some baked goods that look sinful. 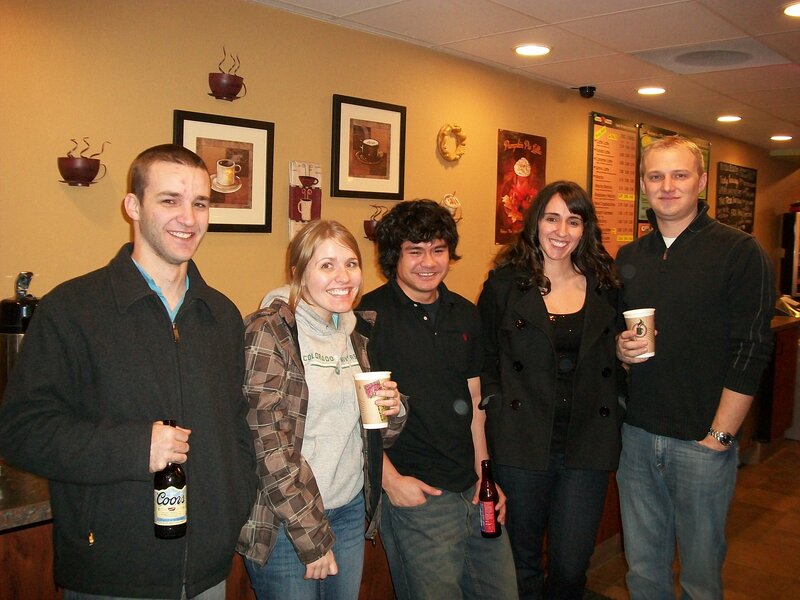 The beverage selection includes coffee drinks, teas, sodas, wines, and microbrews. During the summer it became a habit to stop by after my night biking, to enjoy a lemonade, check my email, and do some people watching. They attract a wide variety of people, including a lot of students – both high school and college. So many “kids” seemed to hang out there to meet and socialize over a mocha latte, Bhakti Chai, or other drinks that resemble dessert. It was enjoyable to sit back and watch the gatherings between friends, families, and students. 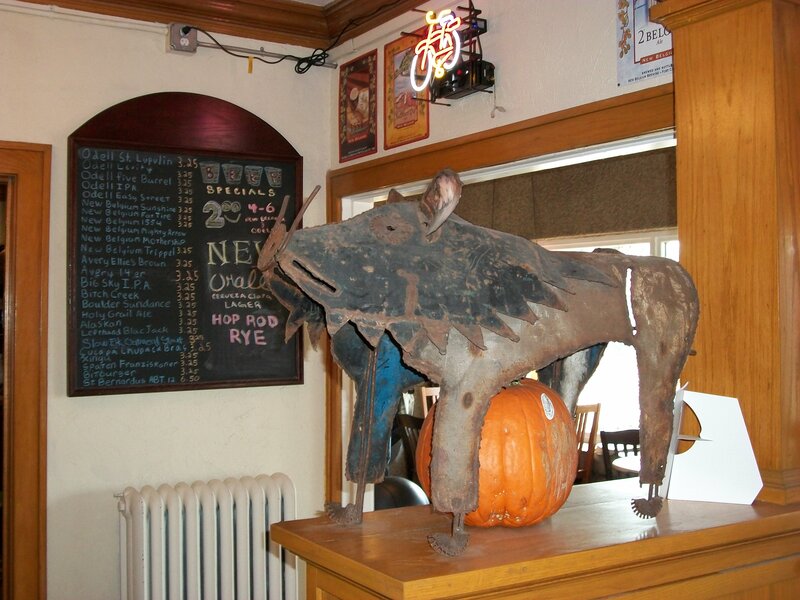 I’ve been to the Wild Boar many times and have never been disappointed with the staff. In fact, what initially kept me returning last fall was a young barista who worked what seemed to be every morning. He was always friendly, quick, and seemed to remember what people liked to drink. Often the night closing staff, much like bartenders at last call, would have to budge people out the door, but did it with much grace. I’m not sure I would’ve had the patience that they did. Across the side street from the Wild Boar is the CSU gardens. During the spring, summer, and early fall, it was not unusual to see friends and families wander over there with their artisan drinks in hand, appreciating the glory of the gardens. A beautiful thing to see on the weekends, and sometimes quite crowded. Wild Boar…it’s a beautiful place to sit and enjoy a cuppa! Cuppy’s Cuppa Cheers….where everyone knows your name. 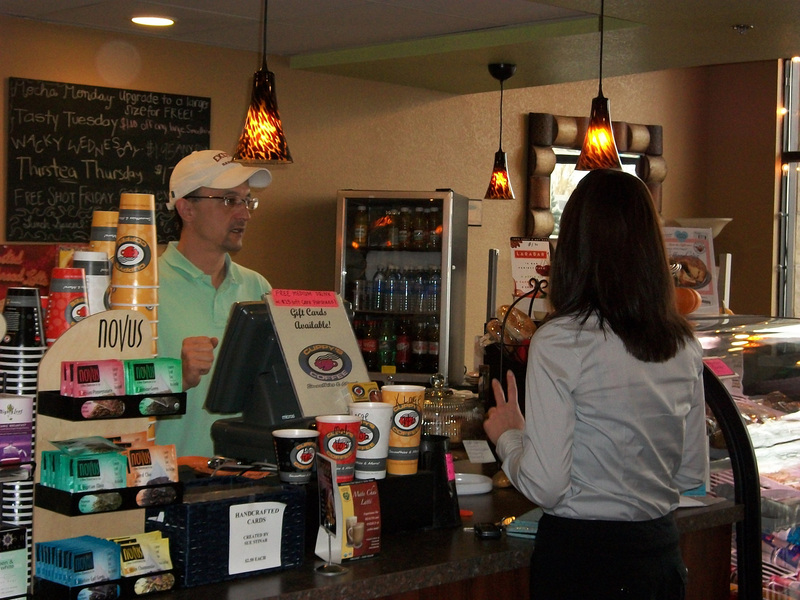 Cuppy’s is located in the Drake Professional Plaza on Drake, near College Avenue in Ft. Collins. I started coming here in April, when I was working for the Muscular Dystrophy Association. Once I planted myself here, it was difficult for me to expand my Ft. Collins coffee shop cruising. 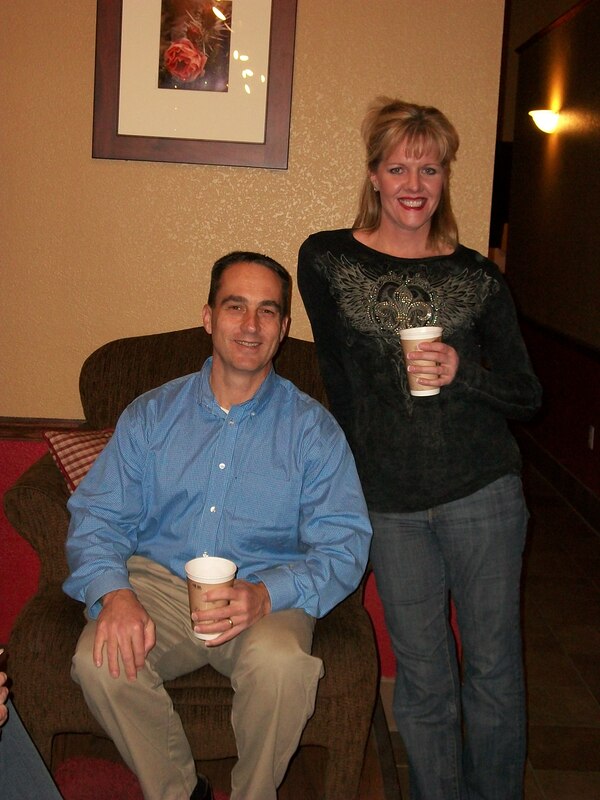 When I think of Cuppy’s, I think of Joe and Krista, the owner and manager. I also think of music, Italian coffee (they serve Caffe’ D’arte), and social media. Late spring I was being “pushed” to dive into Facebook, but I resisted. 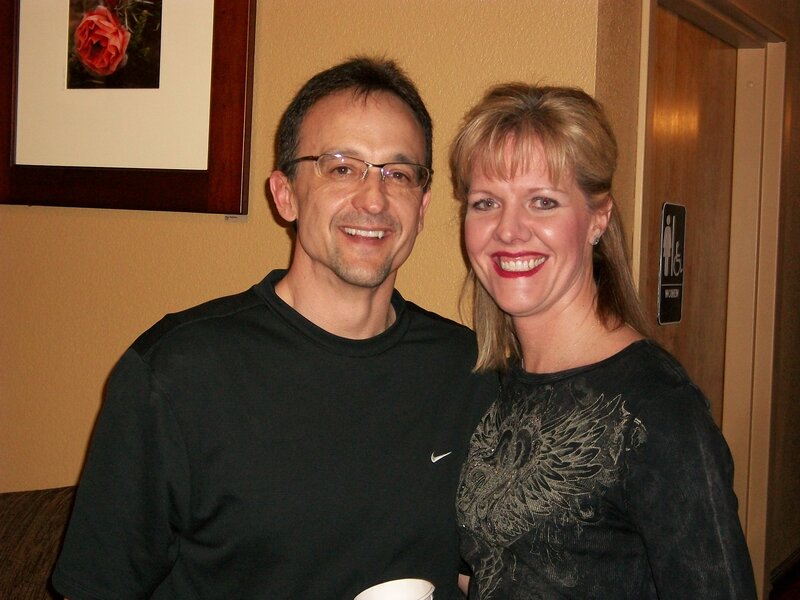 Joe and Krista were both having fun with it, giving me updates on their pages, and telling me that I would enjoy it. Kicking and screaming, I started in sometime around late June. If you know me on Facebook, then you know that I dove in without asking how deep the water was, and just started swimming (thanks, Krista!). The coffee here is from Italy. Yum-yum! I have to admit, I have a special love for Italy, having worked in and managed Italian restaurants, enjoyed Italian food and wine, music, and having taken a course in Italian. Watching an espresso being made here reminds me of Nunzio Vincitorio, the baker at Vincitorio’s restaurant in Tempe, Arizona. If you’ve ever been there and have met Nunzio and his brother, Mario, you would know why that’s a great memory to have. Although it was the Italian coffee that brought me back here the second or third time, it was the customer service and personal connections that Joe and Krista make, that kept me coming back. 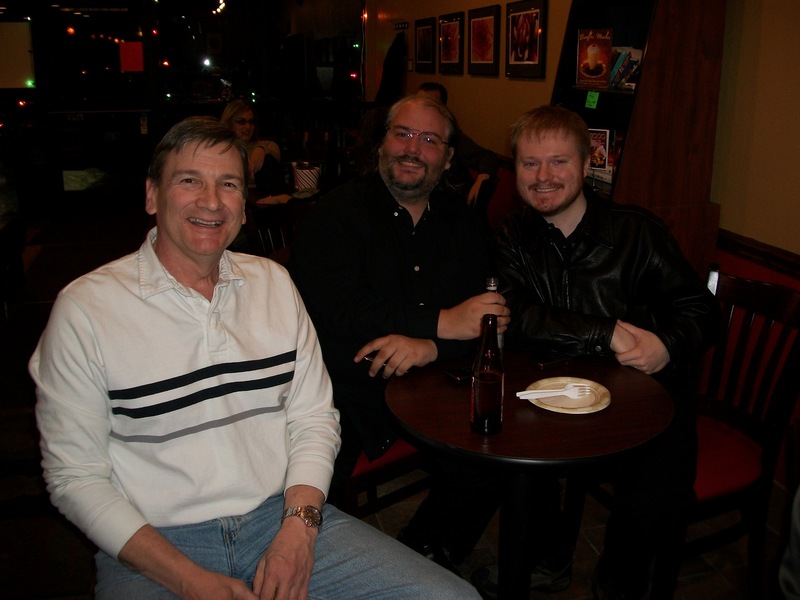 Not only are they friendly, but I think Joe is the reason I met and made Jim a friend of mine (I didn’t give him a choice). As it turns out, Jim is from Iowa and actually was in my small hometown in Wisconsin many years ago for a high school band concert. Small world, big connections. Cuppy’s Cuppa Cheers! One of the best experiences I’ve had in Fort Collins.